There are two years in between Plum and PK, and PK copies everything Plum does. He’s catching her up fast, including in mannerisms, speech and cheekiness. We’ve been wondering this week if we’re getting to the point of starting toilet training with PK. He’s not two yet, but he doesn’t like wearing nappies and is forever taking them off. We used to solve that problem by making sure he had trousers on, but then he worked out how to take those off too! So, if he’s going to take his nappy off, it might be as well to teach him to use a potty or the toilet. I thought it would be longer before we started this again. Maybe it will be – I’m not convinced he’s ready just yet. But since I’m already clearing up after him when he secretly takes off his nappy …. Ahhh … the life of a parent. 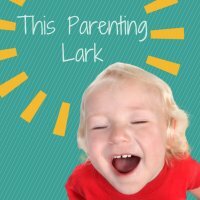 Add your parenting posts to the linky below – old or new, silly or serious. Please grab the code to add the badge to your post, comment on this post and visit one or more of the others linked up. Happy Parenting! Haha. Takes his trousers off. Now, that’s what I cann a rebel. No harm in trying to potty-train him. Each time, stress that’s what happens if other people don’t wear a nappy. Francene Stanley recently posted..More Roman coins found by UK amateur. I would give it a go. I started to potty train Joe at 17months as he always used to stop and shout Poo when he needed one, so thought I would try to get it in the toilet. fashion-mommy recently posted..Strictly Come Dancing is Back!